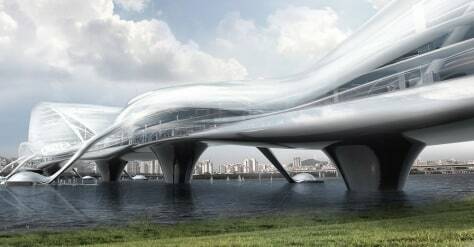 The sleek, sculptural Paik Nam June Media Bridge — connecting Seoul's Dang-Li power plant with the National Assembly Building — will be a multilevel marvel. Inside the solar-powered span you'll find gardens (sprinkled with harnessed rainwater), a library, museum, and stores. Pedestrians and cyclists can leisurely cross the car-free bridge, and boats can dock at the base. Construction is tentatively scheduled to begin in 2012.